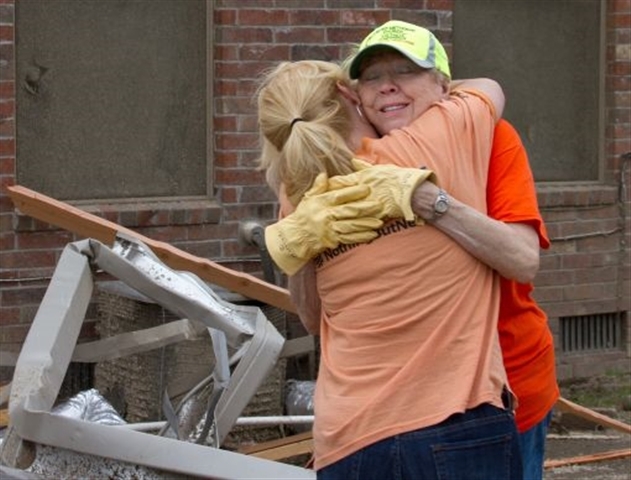 Deadly tornadoes that swept through the upper South and Midwest April 27 had United Methodists, among others, assessing damage and preparing to offer relief. By the next day, at least 16 deaths in Arkansas alone had been blamed on a fierce tornado that cut through 80 miles of suburban Little Rock, Ark., with the towns of Vilonia and Mayflower particularly hard hit. Rescue workers were still searching for survivors in Vilonia, where many homes and buildings were destroyed, including a $14 million public school set to open this fall. Bishop Cynthia Fierro Harvey is asking that local United Methodist churches in the Louisiana Annual Conference take a special offering to assist with UMCOR’s tornado disaster relief efforts. Checks should be marked with U.S. Domestic Disaster Response, Advance #901670. Gifts can be collected in the offering plates, or checks can be sent directly to the Conference office and made to: Louisiana Annual Conference, 527 North Blvd., Baton Rouge, LA 70802. Just remember to mark the memo section of the check with Advance # 901670. Greg Forrester, UMCOR executive for U.S. disaster response, asked for continued prayers for survivors and the work of first-responders. He asked that United Methodist volunteers not go yet to affected areas but instead wait for direction from conference United Methodist Volunteers in Mission. An Early Response Team from the Louisiana Conference has been recruited and is leaving for Vilonia today at noon. Please keep this team in your prayers.